Where in Eversholt did John Bolding live? We don’t know yet. But we do know where he is now. John Bolding is buried in Eversholt churchyard, under this enormous slab of beautifully-engraved stone. The Bolding tomb is the one surrounded by railings, quite the grandest tomb in the churchyard. The above image was made a little after 1913, judging by the tombstones visible. Sometime in 1914-18, the church railings were taken for the war effort, and it seems likely that this is also when the tomb railings were taken too. They’ve certainly gone now, and the supporting kerb stones are scattered round the memorial slab, with rubble from the collapse. It’s possible that the iron of the railings was holding everything together, and removing the railings caused the kerb stones to spread out, which caused the walls of the structure to collapse, which left the top slab lying in the rubble as it is today. A sad end for a grand grave, particularly if iron salvage efforts in wartime are of more propaganda use than practical. The slab that remains, fortuantely intact, weighs something over 600kg, and would have taken a dozen men to lift. John Bolding must have been wealthy. Venetia Barrington turned up some of his story (Thanks!) from Ancestry. John Bolding was born in Ampthill in 1764, son of John and Ann Bolding. He was apprenticed as a surgeon and apothecary, definitely an upper-class sort of apprentice. John Bolding married Elizabeth Cooke (probably born in Toddington in 1764) in 1794 in Ampthill. Judging by which children were born where, they remained in Ampthill until around 1802. They had several children there, the ones I can find are John (born 1796), Thomas (born 1799) and Lucy (born 1801). Their first child to be born in Eversholt was Elizabeth (1803), followed by Mary (1805), John Parker (1806), Ann Jane (1808), Henry James (1810). Their youngest daughter was Eleanor (abt. 1813). 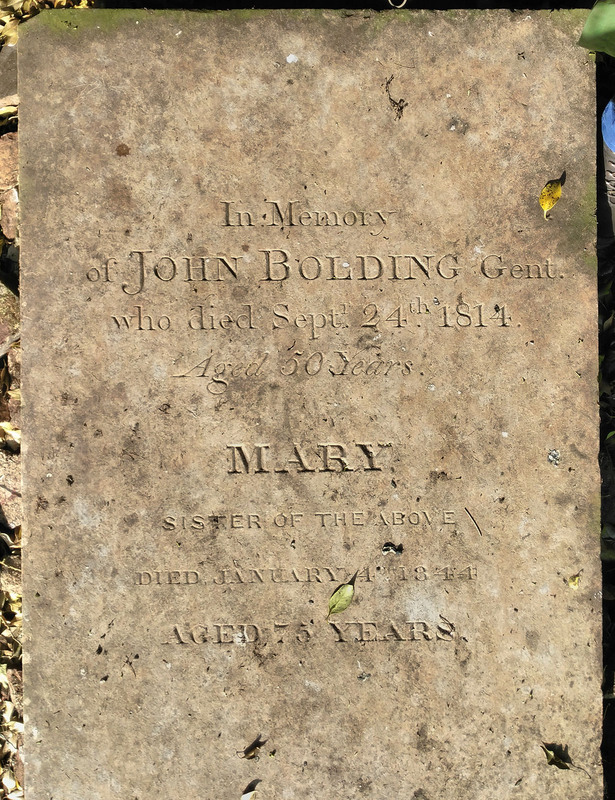 John Bolding died in 1814, the year after his last child was born. His wife Elizabeth died in St. John’s Wood, London in 1840. Several of the younger children appear to have been living in London by the time of the 1840 census so perhaps the family moved away after John’s death. John (born 1764) had a sister Ann (born Ampthill 1762) who became the second wife of Thomas Sandys, widower (born Ampthill 1763). This Thomas Sandys was the eldest son of John Sandys, rector of Eversholt. Thomas likely lived in what is now called Linden House, but what was then called Eversholt House. Thomas was a surgeon too. Venetia very kindly provided a copy of John Bolding’s will. I (EJW) am not sure of the copyright status of that document, so here is just a transcription, produced by the standard method of microscopy, graphological analysis, prayer and divination by means of entrails and burnt printouts of the fourth-generation reproduction of the Georgian clerk’s spidery handwriting. All punctuation marks, and errors, are the responsibility of EJW. This is the last will and testament of me, John Bolding of Eversholt in the county of Bedford, gentleman. I give and devise unto my son Thomas Bolding when he attains the age of twenty one years all my real estate as aforesaid at North Crawley aforesaid, to hold the same to him, the said Thomas Bolding, his heirs and assigns for ever. I give and devise unto my son John Parker Bolding when he attains the age of twenty one years all my real estate as aforesaid at Flitwick aforesaid, to hold the same to him, the said John Parker Bolding, his heirs and assigns for ever. Also I give and bequeath unto my said son John all right, title, interest and produce arising from a mortgage secured on an estate at Great Brickhill in the county of Buckingham. Also I give and bequeath unto my said son John three hundred pounds stock, four per cent annuities, Bank of England. All the rest and residue of my funded property at the Bank of England and all my East India stock I give and bequeath unto my son Henry James Bolding and unto my four daughters viz: Lucy Bolding, Elizabeth Bolding, Mary Bolding and Ann Jane Bolding to be equally divided between them, my said son Henry and my said daughters, share and share alike provided nevertheless and my will and mind is that in case either of my said children die before they attain the age of twenty one years I give devise and bequeath the real and personal estates of them so dying and so by ?? ?? and bequeathed unto the survivor or survivors of my said children, to be equally divided between them, share and share alike, as tenants in common and not as joint tenants. And whereas I have under the will of my late mother Ann Bolding widow the disposal of two thousand pounds stock and interest thereon in the three per cent consols amongst my children as I should direct by my will, after the decease of my sister Elizabeth, the wife of Abraham Phipps, in case of her dying without issue; and, as the said Elizabeth Phipps lately deceased leaving no sons, I hereby give the said two thousand pounds stock and interest thereon as follows: To my son Thomas Bolding one hundred pounds sterling. To my son John Parker Bolding two hundred pounds sterling. To my son Henry James Bolding three hundred pounds sterling. To my daughter Lucy Bolding, to my daur Elizabeth Bolding, to my daur Mary Bolding, to my daughter Ann Jane Bolding, each three hundred pounds sterling on their respectively attaining the age of twenty one years. And the remainder of the said two thousand pounds stock and interest thereon to my daughter Eleanor Bolding on her attaining the age of twenty one years. And all the rest and residue of my real and personal estate whatsoever and wheresoever and of what nature kind soever not hereinbefore disposed off either in possession, reversion, remainder, expectancy or otherwise, I give devise and bequeath unto my said wife Elizabeth Bolding, to and for her own separate use and benefit. And I hereby direct and appoint my said wife sole executrix of this my last will and testament. And I hereby give my said wife full and absolute power to sell and dispose of any part of my real and personal estates provided the money arising from such sale be applied as I have by this my last will directed. In witness whereof I have to this my last will and testament, contained in two sheets of paper, set my hand to the first sheet, and my hand and seal to this last sheet, the nineteeth day of May in the year 1813. Proved at London 20th October 1814 before the worshipful Samuel Pearce Parson, doctor of laws and surrogate, by the oath of Elizabeth Bolding, widow, the relict and sole executrix, to whom admon was granted, having been first sworn duly to administer. So John Bolding was definitely wealthy. He owned real estate in North Crawley and Flitwick, let out. He financed a mortgage on another property, and had income from it. He had at least £2300 invested in stocks and securities. He could afford a decent tomb. How did John inherit so much money – £2000 – from his mother? Where did it come from? But, where did he, and his substantial family, live? It wasn’t what was then Eversholt House, where the Sandys family lived. It wasn’t the great house Linden on the recreation ground, where Lucy Monoux lived. There isn’t a record of him in Church Farm or what is now School House, but it’s not inconceivable he lived there. Anywhere else? Any good ideas? 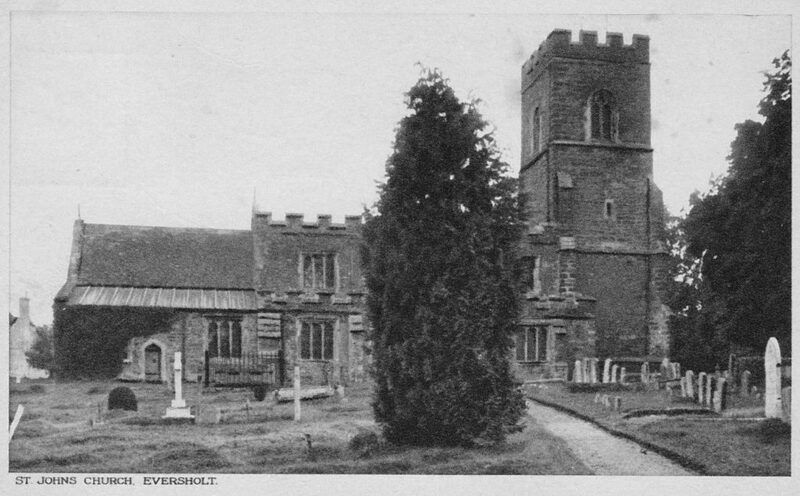 Venetia suggests the family moved away from Eversholt after John died in 1814. It’s notable that Elizabeth, John’s widow, wasn’t returned to Eversholt for burial, yet his sister, Mary was. Maybe Mary carried on living here? Please let us know if you know any more about the Boldings! Perhaps that’s our John’s father. I will try to check. Thanks!